Reversible Homogenizing Mixer Improves Extracton Process, Increasing Yields by 4-7%. Problem: A major pharmaceutical manufacturer on the east coast was having problems with the production of a pharmaceutical reagent because the volumes were too small and the yields too low. The manufacturing process used includes an extraction in which steriods are removed from source materials. If the steroids content of the reagent is too high, steroids tend to precipitate over time, or during shipping or shaking, and give the reagent a cloudy appearance. Cloudiness in the reagent might also imply contamination with bacteria. Quality standards of the manufacturer specify pharmaceutical reagents must be clear and remain clear during shaking or shipping. In the steroids extraction, two immiscible liquids, a source material and a solvent (a low boiling, dense fluorinated hydrocarbon), are emulsified, then separated by high speed centrifugation. The emulsion must be fine enough to get good extraction of the steroids by the solvent, but be "relatively easy" to break during phase separation. 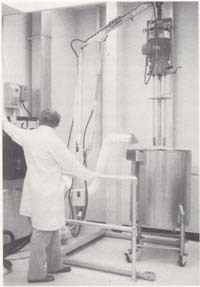 During early manufacturing, the emulsion was effected using multiple, 2-liter capacity, laboratory-type blenders operated by technicians. Production was slow and labor intensive. Due to small volumes and frequent cleaning, yields were low. The extraction, at optimum operating conditions for the process, was removing only 60-65% of the steroids. The blender motors were designed for intermittent research use. In continuous production, motors were failing about once every six months. It was costing $3600-$4800 per year to repair or replace blenders. Operator attention and supervision requirements were consuming hundreds of person-hours. Solution: The pharmaceutical company conducted extensive testing of four different types of emulsifying equipment before selecting a reversible homogenizing mixer. In comparative laboratory tests, the reversible homogenizing mixer provided superior steroids extraction while operating in the "up" mode, umbrella flow mixing pattern with a speed about 80% of maximum. Based upon these results, a decision was made to purchase a production size reversible homogenizing mixer. The production size mixer is mounted on a hydraulic stand which raises the mixer for positioning one of the portable tanks (40-400 l). Batches range from 10 to a maximum of 150 liters. After appropriate quantities of source material and solvent are introduced into the tank, the mixer (7.5 HP, 3600 RPM, 33" immersion length, 5" diameter, five bladed, 24 degree rotor) is lowered into the tank to a point where the double stator mixing head is positioned approximately at the interface of the two immiscible liquids. The adjustable baffle plate is positioned slightly above the liquid surface. The reversible homogenizing mixer is started at low operating speed in the "up" mode to form the umbrella flow pattern. A variable-frequency motor speed control is used to gradually increase the rotor speed up to 2700-2800 RPM, which is approximately 80% of maximum. The variable-frequency motor speed control provides constant torque to the mixer over the entire speed range and has a digital dial so the speed adjustments can be reproduced from batch to batch. The emulsion is made very quickly. The mixer is then raised and the portable tank removed for separation of the phases by centrifugation. Results: After over a year of service, the system has required only minor routine maintenance. The reduction in labor and supervision requirements have been tremendous Approximately $4,000 in blender maintenance has been eliminated and 600 person-hours per year are being saved over what was required to meet previous production needs. Pharmaceutical reagents yields have increased 4-7% by volume. The yield increase of the high valued reagent alone paid for the reversible homogenizing mixer system installation in just two months. Every batch of reagent made with the new system has been crystal clear. Steroids removal has been up to 99%.